Surgicare Plus is made from Natural Rubber Latex. The powder free gloves, eliminates all risks associated with powder. The glove is anatomically shaped with thumb ball effect, reducing hand fatigue during surgical procedures. 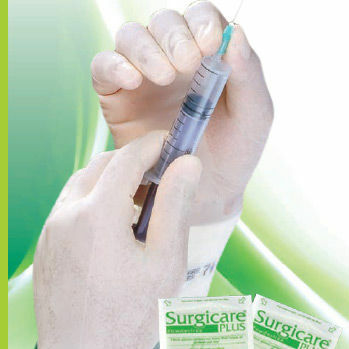 Surgicare Plus provides excellent barrier protection for both doctor and patient. Latex protein no more than 50µg of protein per dm2, eliminates risk of Latex Allergy – Type 1.Chemical residue almost nil, eliminates risk of Contact Dermatitis – Type IV AllergyAbsence of powder eliminates dangers associated with powder, preventing granulomas, adhesions, fibrosis and occupational asthma. Does not contaminate sterile work area. Latex film structure passes Viral penetration Test (ASTM F1671:2007)Manufactured in clean environment to achieve bio burden level of less than 20 cfu prior sterilization. This achieves low Pyrogen level after sterilization.Manufacturedin a clean environment to comply with EN 556 & ISO 13485 requirements.Sterilized in a validatedprocess cycle to achieve sterility assurance levelof let,and air wash cycles to reduce sterilant residue to less than 4mg/unit.